Galleria Franco Noero presents an unprecedented project that has emerged from a dialogue between Francesco Vezzoli and Pablo Bronstein and from an imaginary “invitation” from the two artists to the master of twentieth-century Italian art Giorgio de Chirico. It is the twentieth-century metaphysical artistʼs world of the imagination that has inspired the projects presented by Vezzoli and Bronstein, with a work by de Chirico himself acting as a foil. It has been chosen as a tribute by the two artists and will remain on show during the first week of the exhibition, in the spaces in Piazza Santa Giulia 5. Francesco Vezzoli imagines the ground floor of the “slice of polenta” building – the Fetta di Polenta – as a total metaphysical space, devoted to the aesthetic language of Giorgio de Chirico and, in particular, to those landscapes of his which portray architectural forms and elements inspired by the piazze of Italy, which are themselves often inspired by the regular squares with arcades all around, which are so typical of Turin. The artist has commissioned the creation of a large trompe-lʼoeil inspired by a painting in which de Chirico depicts an urban space with a statue at the centre. Visually, this recalls the monument in Piazza IV Marzo in Turin dedicated to Giovanni Battista Bottero, the journalist who founded La Gazzetta del Popolo. Vezzoli has replaced the statue with a Portrait of Sofia Loren as the Muse of Antiquity (After Giorgio de Chirico), a bronze sculpture in which the face of the famous Italian actress appears in place of that of Ariadne, one of the mythical muses portrayed by de Chirico. 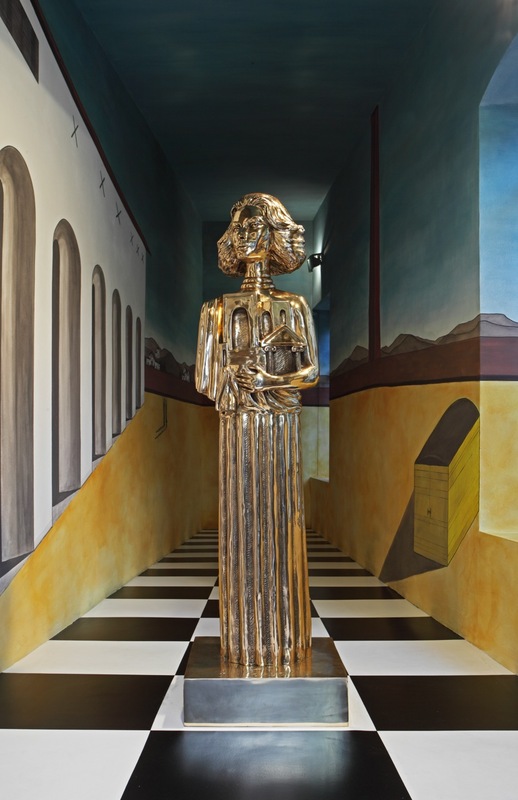 In the performance conceived by Pablo Bronstein, the British artist considers history as a decontextualised subject which is given contemporary relevance by taking inspiration from de Chiricoʼs paintings, looking at them as a sort of limbo in which the individual elements appear to be abstracted from their time. For the project, which is set to run during the week of Artissima in the galleryʼs Project Space, Bronstein has chosen to present a “living” monument inspired by the tomb of Richard the Lionheart in the French cathedral of Rouen, and interpreted by a professional dancer. The tension sparked by the challenge – that of a human body obliged to portray the immobility of a monument – continues the artistʼs typical approach to performance. His choreographies often come from an interpretation of the splendour of the decorative and architectural vocabulary of the past in its relation to the human body.